I first met Terik while working as a barista at Little Sister Coffee Maker. He’d come in for coffee and a chat. Occasionally there'd be a pizza tucked under his arm. 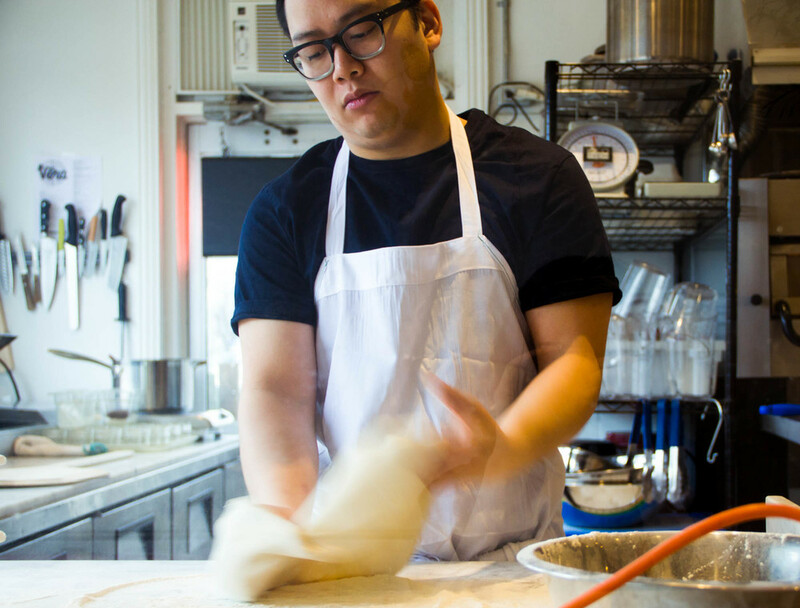 Then, over a year ago, he opened Vera Pizzeria e Bevande in South Osborne, and it immediately became my go-to spot for a traditional Neapolitan-style slice. Terik’s reverence for his work is exactly why I asked him to show me how the perfect Pizza Margherita is made. Terik Cabildo: There are two Neapolitan pizzas protected by Italian cultural standards: Marinara Pizza and Pizza Margherita. 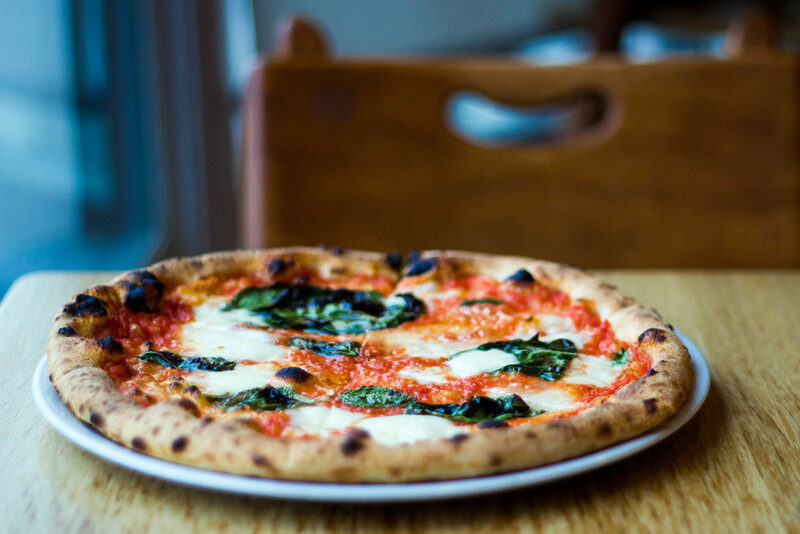 A Margherita is made with San Marzano tomatoes, buffalo mozzarella, basil, olive oil and sea salt. It was made for Queen Anne and became a kind of national dish. It’s also connected to the Italian flag because of the colours. Here, I use fior di latte, which is cow’s milk mozzarella, just because water buffalo mozzarella is roughly double the price. All that there is in the dough is 00 flour, which is really fine, as opposed to All Purpose flour. 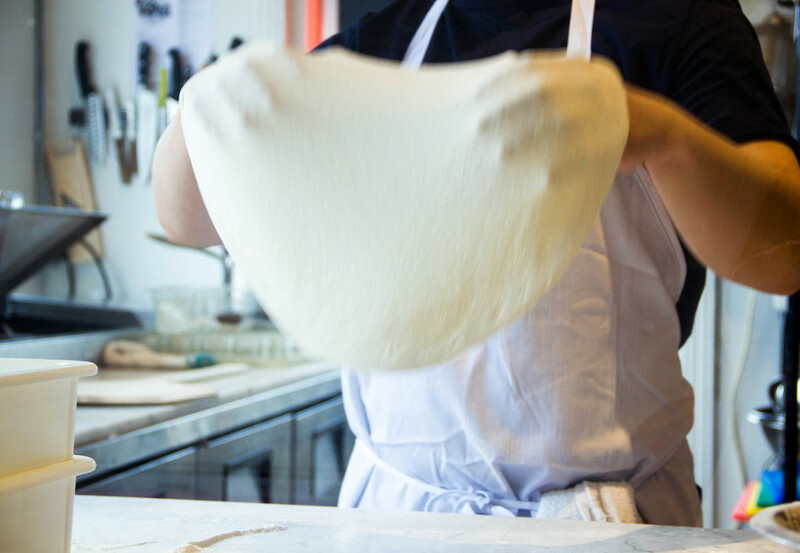 This flour comes from Italy, it is unbleached and un-bromated, and it has a high protein content with a gluten structure that is more particular to pizza dough. That makes it stronger and more malleable so that I can work with it. 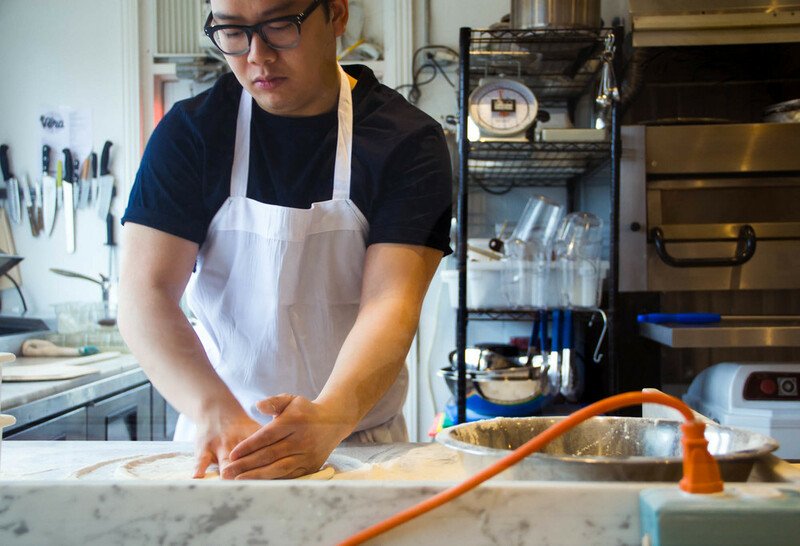 The only other ingredients in the dough are salt, fresh yeast, and water. I’ve started experimenting with a sourdough starter to help with the fermentation of the dough and to create a deeper flavour profile. 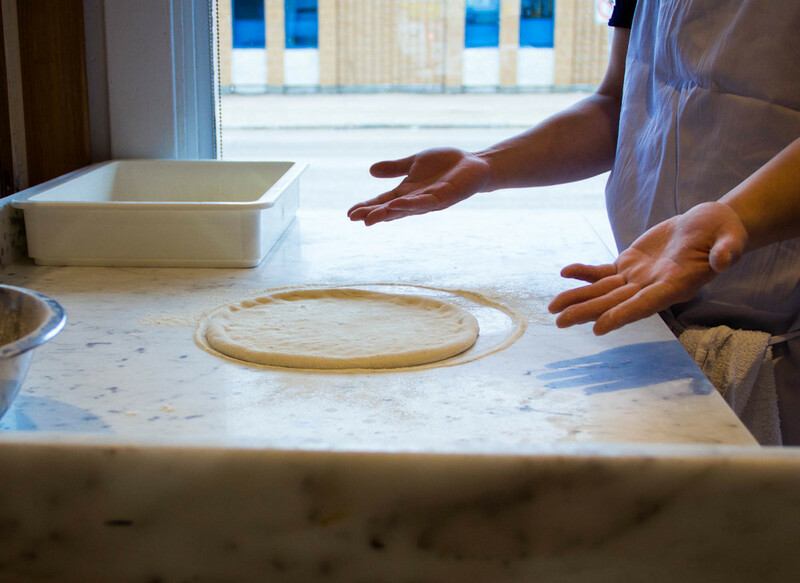 When we make a pizza, it’s important to take out the dough and make sure it’s a circle. I think what home bakers struggle with is using enough flour to make the pizza. Also, I’d recommend letting the dough sit for between 2 and 4 days before you prepare the pizza. That’s going to improve the flavour a lot. Once I have the dough out of the tray, I give it a good coating of flour. Ideally, I want to be working on a wood or marble surface. As I stretch the dough, I form a strong base in the centre, pushing the air towards the crust. I try to aim for a one-inch crust. 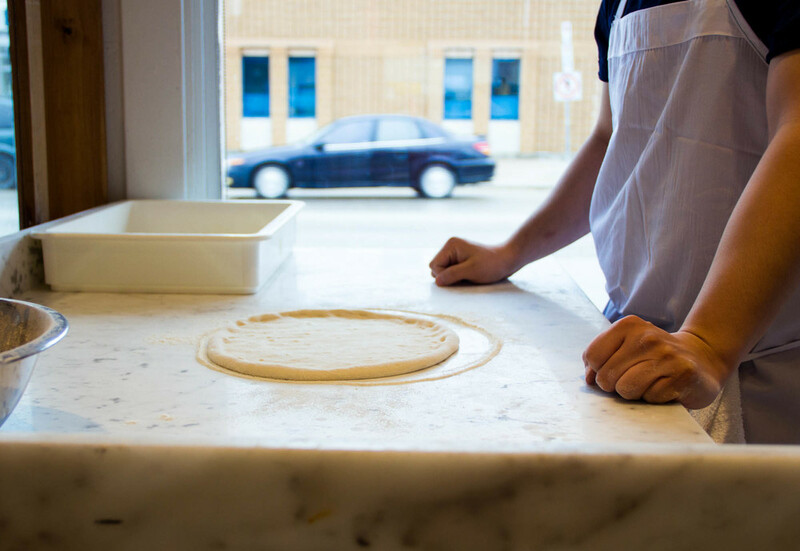 When we stretch our dough, we use the Neapolitan method, passing it from hand to hand while rotating the dough. I wouldn’t recommend it for home bakers, because it takes roughly a thousand tries to get it right. It’s a very specific movement, and I’ve never seen two people do it in exactly the same way. Once I’ve stretched the dough to 12 inches, I ladle on the sauce made with San Marzano tomatoes. I place the sauce in the centre and then move it outwards toward the crust. How I shape the pizza and then where I put the sauce and ingredients really defines how the pizza will look when it comes out of the oven. Next is basil, which we get from Neva Farms in Landmark. Then the fior di latte, a little bit of olive oil, and that’s it. I’m ready to put this pizza into the oven. Our oven is at 800 degrees fahrenheit. For home bakers, a pizza stone, or even doubling up a baking sheet, one upside down, one right side up, and then leaving the oven on for an hour and a half at its highest temperature is the way to try and replicate this style of pizza oven. The person who helped invent this oven was able to break the lock on his oven’s self-cleaning cycle so that he could get it up to those temperatures. Once it’s in the oven, you’ll see that the crust starts to puff up rapidly, and dark spots begin to develop along the bottom of the pizza. 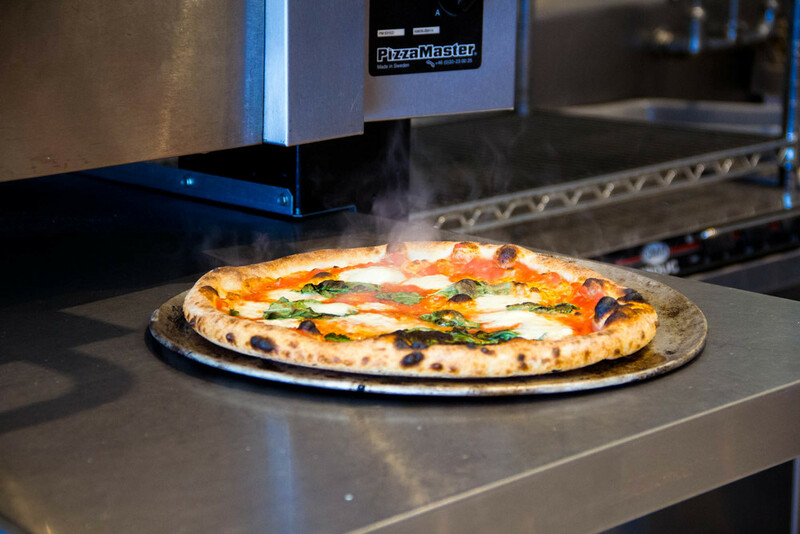 By Neapolitan standards, it should take 60-90 seconds in the oven. But realistically, with multiple orders, each pizza cooks for about a minute and a half to two minutes. 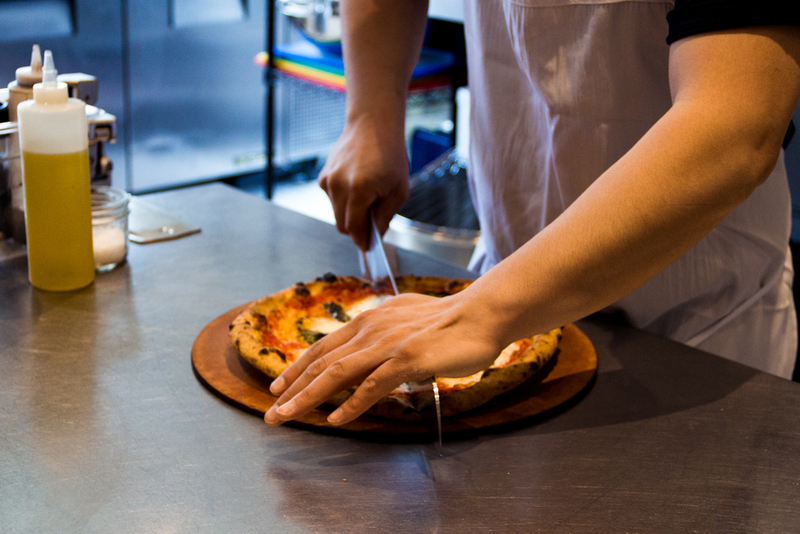 With a traditional Neapolitan pizza, the chef doesn’t cut it, the customer eats with a knife and fork. Part of that is a little more sauce and a higher moisture content in the cheese. The centre of those pizzas tends to be very moist. It would be hard to pick up. We cook our pizzas just a little bit more than they would so that we can cut them for customers. Then we finish with a bit of olive oil and Malden sea salt, and that’s it. That's a Pizza Margherita.